The Chickamauga Campaign: Book update. Time to check in. The book is nearly done with layout, and will soon go to the printer. Mr. Savas and I did have a conversation today concerning one issue – length. I seem to be a bit wordy. As it stood, the tome was pushing 800 pages. That’s a lot. For those of you wishing to keep score, Scott Hartwig’s new book, “To Antietam Creek” weighs in at 794 pp – and Johns Hopkins, his publisher, priced the thing at $49.95. That’s a lot. So we will tweak a couple of things to make sure the product matches the pricing. We are shooting for closer to 700 or 750 pp. We are working on the narrative flow, ending the action with the close of battle on the 19th. This means volume 2 will begin with the overnight conferences in both armies, as they prepare for battle on the 20th. I was conflicted about where to put those chapters, since they are really transitional pieces between the 19th and the 20th. The need to watch our page count helped tip them into Volume 2. We are also trying to avoid excessive duplication in things like the bibliography. I hoping to to explore a creative alternative to putting the same bibliographic information in all three books – that seems very wasteful. Maybe we will make it abvailable online, or as a download, for the first two volumes. Ultimately, of course, the full bibliography will be in Volume 3. This gestation has been a lot longer than I expected. But then, the research and writing took damn near 16 years. What else should I have expected? I don’t want to put a time frame on publication just yet, but we are really in the final stages. I hope this book lives up to expectations. It certainly lives up to mine, and then some, but then, I might be a bit biased. I came across this photo some time ago. 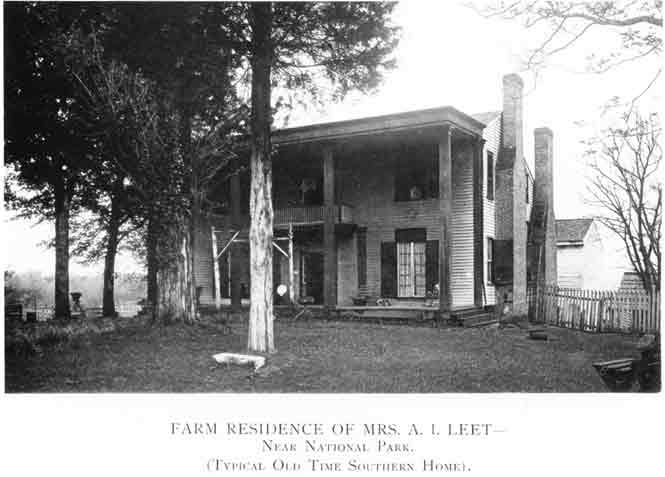 This is the house of Arthur Leet, of Leet’s Spring, scene of a sharp action between John T. Wilder’s Federals and John Pegram’s Confederate cavalry a week before the Battle of Chickamauga. Union and Confederate casualties were laid out on the porch. I confess I don’t know if this an image of how the house looked at the time of the battle, or a postwar structure (in whole or part.) It is a somewhat grander affair than the more primative cabins found on the battlefield. Of course, Arthur Leet was fairly well-to-do by 1863, North Georgia standards. I have begun to spend some serious time digging through archives for the Atlanta Campaign. Previously, I have visited the University of Texas at Austin, the Bentley Library at University of Michigan, the Tennessee State Library and archives, and a couple of smaller sites. Most recently, I spent two days at Carlisle, at the hugely impressive US Army Heritage & Education Center. So many of these places now allow digital photography of documents, which is a godsend to researchers. I now have nearly 2,000 digital images (jpegs and pdfs) of documents pertinent to the campaign, including hundreds of letters and diaries. Now, of course, all I have to do is sort them out… should be a snap.